If you have any questions or suggestions you are welcome to join our forum discussion about Forex Trading Using the Slow Stochastic Oscillator . In the current article we will outline two trading strategies used in stock trading, but the first one can also be used on the Forex market. Both of them use only the Slow Stochastic oscillator. The first strategy is based on multiple time frame analysis. First, we need to determine the general trend on the 1-hour chart. This strategy works only, if the market has made a higher high or a lower low in the past couple of hours. As we determine the larger trend, we will later enter positions only in the same direction. Next, we drop down to the five-minute time frame and use a 12-period slow stochastic. A buy signal is generated when the faster line, %K, goes in the oversold area (below 30-20) and reverses back up. Conversely, a sell signal is generated when the fast line enters the overbought area (above 70-80) and reverses down. Stop-loss order should be placed beyond a recent trading range or the opposite swing high/low. If the market goes in the desired direction by the amount risked, you should move the stop-loss to breakeven. You should exit the position and take profits when the fast line enters the opposite extreme area (from overbought becomes oversold and vice versa), reverses and leaves it. 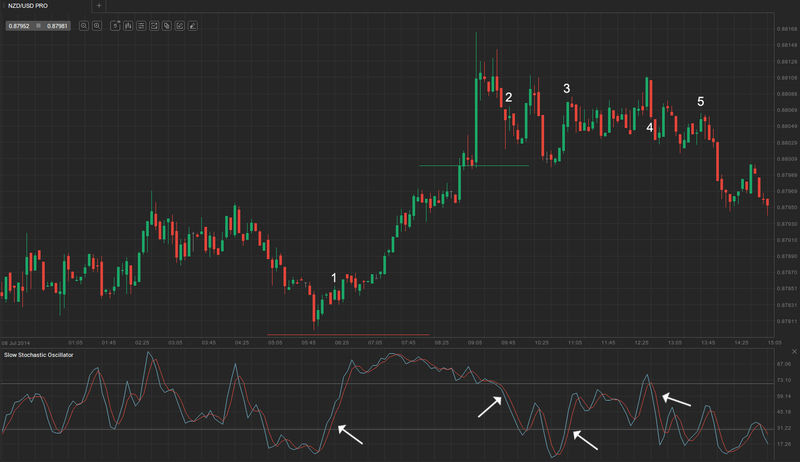 You can also exit on divergences between the 1-minute stochastic and the current trend. If the market performs such a strong move that our profit target is reached almost immediately, it would be wise to take the profit immediately as climactic exhaustions are typically followed by a trend reversal or a trading range. Also, if this strategy leads to two consecutive losing positions during the day, it is advisable to stop trading and resume on the next day. Check out the following example. On the example above you can see that the market has been in a very decisive and pronounced bull trend for over 50 bars, thus we will limit our entries only to long positions. Next, we drop to the 5-minute time frame to better establish our entry point, stop-loss and profit target. On the second screenshot we were presented with several suitable long entry signals. First, the slow stochastic reversed in the oversold area and edged higher at bar 1, thus we enter long above its high at 0.8785. Our stop loss is placed 5-10 pips beneath the most recent swing low, as marked by the red horizontal line, at 0.8770 US dollars. Our capital exposure is 15 pips. As soon as the price rises by 15 pips above our entry point, we must move our stop at breakeven. It is hit at 0.8800, which is visualized by the green horizontal line. Upon reaching it, we should decide whether we will remain with our entire position on the market, or close half of it and leave the other half standing. In any of the two scenarios we must trail our stop to breakeven. 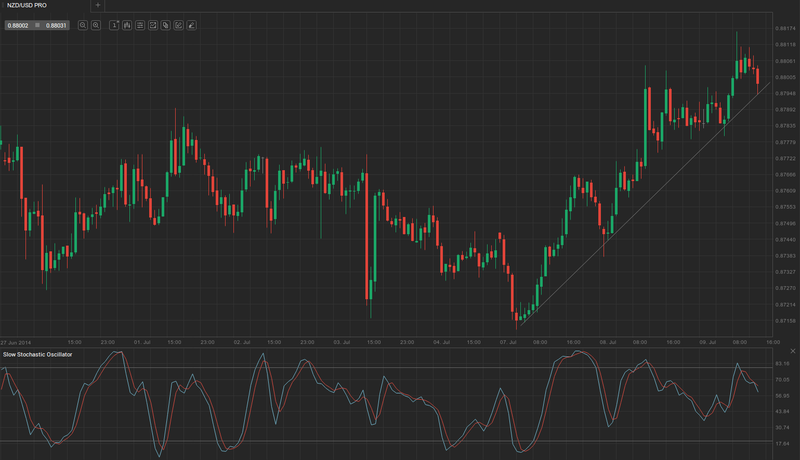 Later on, our trade is exited at the close of bar 2 where the slow stochastic left the overbought area. At bar 3 we were presented with a yet another entry option as the slow stochastic bottomed and rebounded above the oversold area. We go long at the close of bar 3. However, the market entered a trading range and direction was shifted by a two-bar reversal which ended with bar 4. The following sell-off gunned our stop-loss, rendering the trade a loser. Another entry signal was generated at bar 5 but it was once again a failed signal and triggered our initial stop-loss. Nevertheless, the first winning position offset the later two’s losses. The second strategy is best suited for trading stocks. The system is used on the 1-minute chart in conjunction with a 21-period slow stochastic. The most important aspect of the strategy is that it is practiced only in the first trading hour of the day. For further optimization, trades should be entered only in the direction indicated by the 14-period Stochastic on the 30-minute time frame. If the faster line (%K) is above the slower line (%D), this indicates bull momentum and you should stick only to long entries on the 1-minute time frame, and vice versa. After the market opens, you need to look for a point where both stochastic lines are in the overbought or oversold areas and then cross. As soon as they cross, this gives a signal that the price will be reversing and you need to enter the position, if it is in line with the larger time frame trend. Stop-loss orders must be placed at the previous higher low for a long position, or the previous lower high for a short position (actually several pips beyond them to avoid random noise triggering). The high or low of the day must be avoided as stop-loss levels. As the market moves in the desired direction, you must trail your stop to the next swing high/low. As for the profit target, there is actually none. The trade must remain open until your trailing stop is hit or right before the market closes.